One of the many lasting legacies from the 9-11 terrorists attacks will be the indefinite detention of suspected terrorists in the U.S. Military base in Guantanamo, Cuba. It is a moment in this country's history that will undoubtedly be discussed for decades to come, as we all recall these prisoners -- detained outside of the United States and not afforded due process under our judicial system -- and debate the moral issues behind their confinement. "Janet's courtroom sketches and commentary comprises a significant moral document, of interest to every citizen who cares about what the United States government is doing in his and her name. 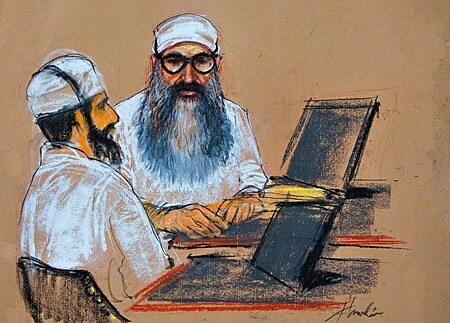 Sketching Guantanamo helps bring out of the shadows and into the light of public scrutiny these extra-judicial trials." Featuring nearly 150 drawings, photographs of the surrounding facilities and commentary from the artist, Sketching Guantanamo: Court Sketches of the Military Tribunals, 2006-2013 will also be an account of Hamlin's experiences at Guantanamo over the last eight years. 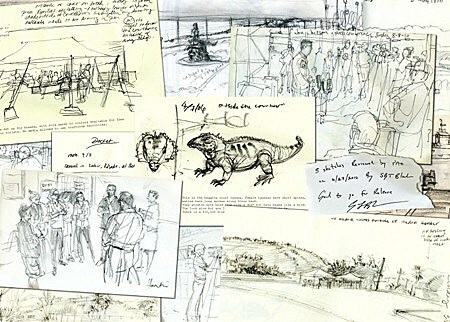 Sketching Guantanamo is tentatively set to arrive in stores this October.